You might remember the original GPD Pocket, which hit retail only a year ago. The new GPD Pocket 2 laptop has now hit IndieGogo and has secured five times its funding goal in one day, with a month to go. The device sequel features a faster processor, an updated keyboard layout, and a sleeker design. Via IndieGogo you can pre-order-pledge for the new device from $529 (said to retail for $729 later this year). 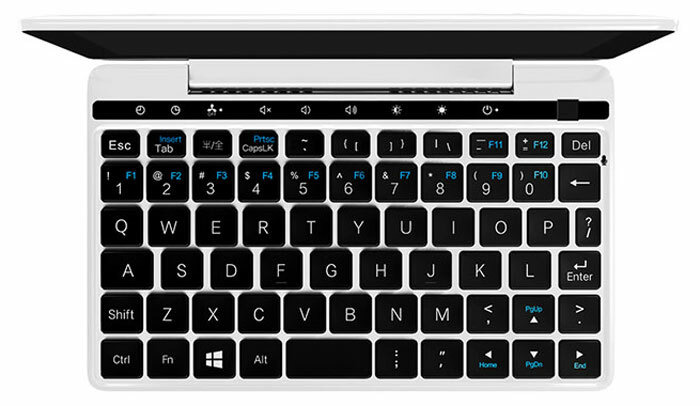 The GPD Pocket 2 is a magnesium alloy unibody clamshell design 7-inch screen laptop, like its predecessor. Its dimensions are 181 x 113 x 8-14mm thick and it weighs just 464g. Inside you will find a 2C/4T Intel Core m3-7y30 processor, accompanied by either 4GB / 8GB LPDDR3, and 128GB flash storage. 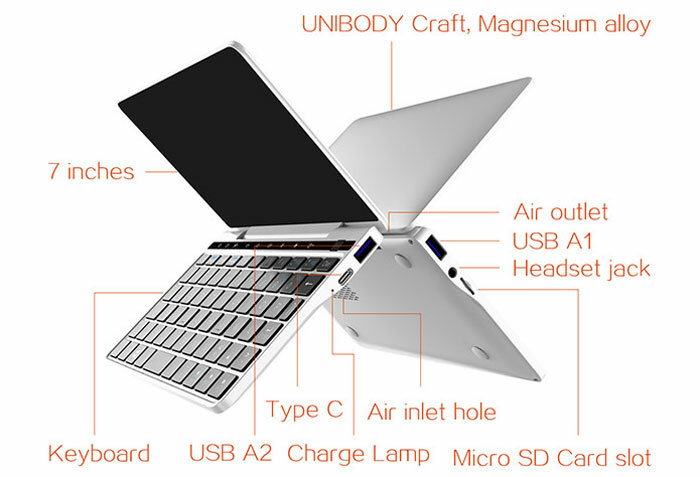 It offers Wi-Fi and Bluetooth connectivity and ample ports which include; 2x USB A, 1x USB C, micro SD (up to 2.4TB), headphone/mic. A Hub can expand this connectivity to include more USB ports, extra memory card readers, Ethernet, and HDMI. Looking more closely at individual components, starting with the screen, we see this device uses an H-IPS type display with wide viewing angles. The screen is covered in Gorilla Glass 4, as it is a touch screen with multi-touch support. Screen resolution is 1920 x 1200 pixels. 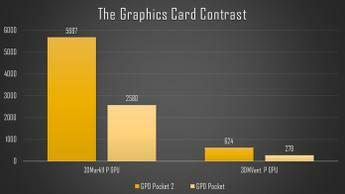 The iGPU pushing pixels to the screen is Intel's HD Graphics 615. Portability isn't all about a device's size, decent battery life is important too. GPD has installed a 6,800mAh Li-Po battery which it claims runs for between six and eight hours, depending upon how it is tasked. If you do need to charge up on the go, GPD says that you can use a common or garden power adaptor you might already have for your smartphone, as long as it delivers 5V/2A charge output. 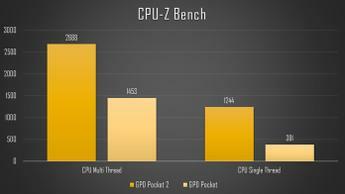 Furthermore the device supports fast charging with the PD 2.0 protocol. Other nice design tweaks delivered in this second gen device are; faster storage with read/write of 267/120MB/s performance, optical finger navigation mousing, new 'Chocolate' keyboard design, and active cooling with a one-button fan mute. As mentioned in the intro, you can pre-order the 4GB RAM / 128GB storage GPD Pocket 2 now for $529, and the 8GB RAM / 128GB storage version is $599. At the time of writing the IndieGogo project has gained $533,788 in pledges. For further analysis it is worth a look at the Liliputing preview YouTube video which I've embedded below. wonder if they might launch an R model? Yeah, me too. Something subtle is going on here. I'm still debating a GPD Win, personally… Maybe when they get cheaper. Same… its a pointless form factor all things considered, but I still kinda want one.